In this weeks holiday season show we have another different type of show. On todays show we have two interviews and an episode of Fitness Behavior. Interview: Thorsten 'The Geek' from www.trirating.com is on the show this week. In this interview we talk about the best performances of 2012. What were the best performances in a single race, who was the best overall athletes and what races were the hardest? Thorsten brings the stats forward to help us figure these questions out. Fitness Behavior: In this episode of Fitness Behavior Bevan covers 'crucial moments' and how we can pre-plan for these. It's a great tool to help us overcome challenging moments, in both life and racing. Interview: This week we have Barry Siff back on the show. He shares what he's been up to, how the Hits races are going and his thoughts on ITU. It's a great interview, Barry knows his stuff. Fitness Behavior: We also have a episode of Bevan's other Podcast, Fitness Behavior. In this show he talks about 'The Process Challenge'. If you want to download the PDF you can get it from here. It cost $3 U.S.
News: IMWA results, Timex 226 results, Matt Rogers does IMWA. This Weeks Discussion: Now that we are doing our IMTalk's Ironman finishers we want to have different grades for the different times you guys do. So for this weeks discussion we want you to come up with the names that we will use. Here are the different categories: Sub 9, 10, 11, 12, 13, and over 13. We also need a special PB title as well. Comment here. 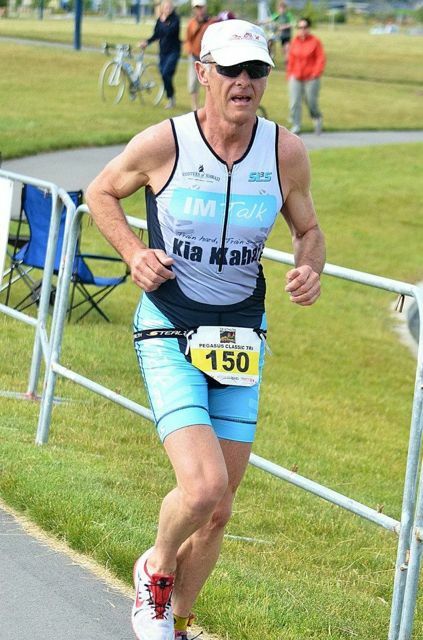 This Weeks Photo: DDJ Super Dave Dwan is looking sharp in his IMTalk tri suit at the House of Travel Festival of Triathlon. Interview: This week have Russell Cox from www.trainstravels.co.uk. Russell did an interesting piece on the difference between North American and Euro athletes at Kona. In this weeks show he shares some of his insights. Website of the Week: Mike 'Farnborough Fox' Hewison sent through this weeks websites: Friction-Facts.com, Bikeradar.com. They cover how we can save a lot of power in our chains. This Weeks Website: Germany website with good swimsets, Meditation book Bevan was talking about. 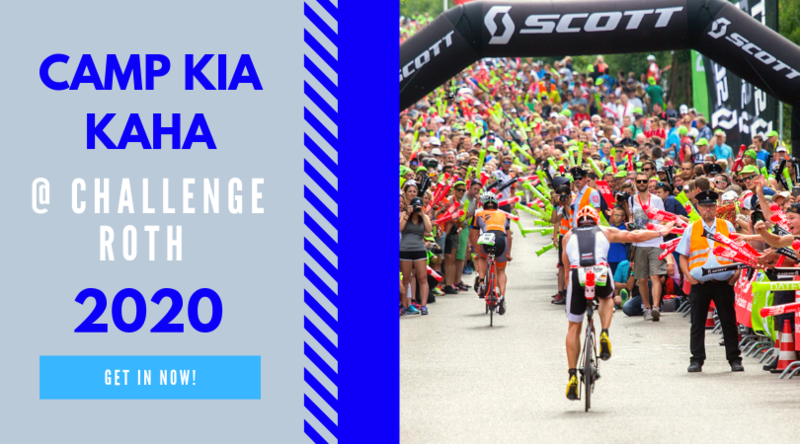 News: Challenge Family confirmed a new race in Italy and they are taking over Phuket, Results from Hits Palm Springs, IMWA is coming up, Chrissie has retired, Change in the drafting rules. This Weeks Discussion: One of the pros from Team TBB came up with the idea of starting the pros later in the day at IM races. For example the pros would start at 12pm and then they would finish around 8pm when the crowds would be at their biggest. What do you guys think about this? What's the good and bad of this idea? Comment here. 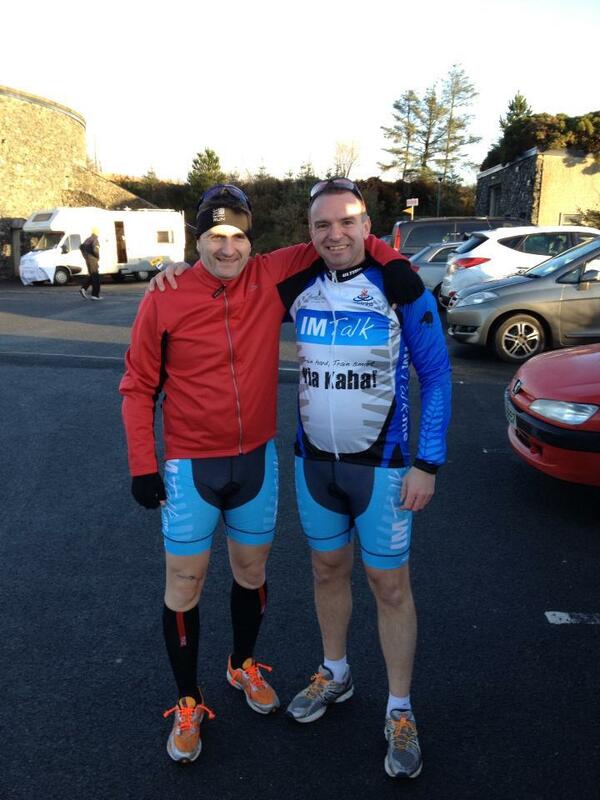 This Weeks Photo: This weeks photo is of Frank McVeigh and Jeff 'The Explosion' Curry in their cool IMTalk gear at the Tri Limits Duatlon at An Creagen in Northern Ireland last weekend. Age Groupers of the Week: This week we have two age groupers. Jason Lentzke sent through his wife Jennifer who won the Hits IM distance race last weekend as an age grouper. Plus Don Ferguson send through Dave Orlowski. Dave competed in the first IM in 1978 where he got third. 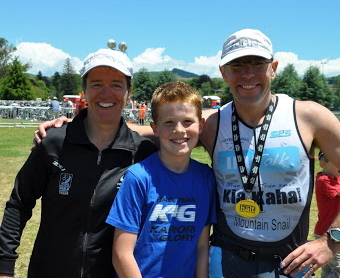 He's still racing and he's aiming to complete in every IM in the world over the next 5 years! Don says he's a great guy as well. High 5: Matt 'The Peaceful Tri Ninja' sent through this weeks High 5 on tips to get out of bed to train in the morning. Website of the Week: James 'The Wiseone' Bowtell sent through this fun site about doping. Check it out here: www.sorryidoped.com. Coaches Corner: John give an update to his Project 2014 plan to date.